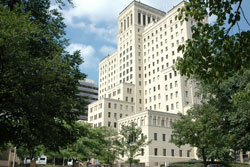 Allegheny General Hospital (AGH), part of the Allegheny Health Network, has established a multidisciplinary, team-based approach that standardizes the way patients suffering from pulmonary embolism (PE) are diagnosed and treated. Developing integrated approaches like this to treat increasingly prevalent diseases is very important for improving patient outcomes and overall quality of care. Pulmonary embolism has quietly become the nation’s third-leading cause of cardiovascular death after heart attack and stroke. To combat this growing public health concern, Allegheny General Hospital (AGH), part of the Allegheny Health Network, has established a multidisciplinary, team-based approach that standardizes the way patients suffering from pulmonary embolism (PE) are diagnosed and treated. AGH’s new pulmonary embolism response team, or PERT, features cardiologists, pulmonary and critical care specialists, and radiologists. It is believed to be the first multidisciplinary, standardized approach of its kind in the region focused on quickly identifying and then treating a disease that, according to the American College of Cardiology, affects one in every 1,000 to 2,000 people in the United States. After rolling it out at AGH, Allegheny Health Network plans to implement the team-based approach system-wide. The PERT approach features a one-point contact system to expedite the delivery of care. If an acute pulmonary embolism – a sudden blockage of an artery in the lung – is discovered in a diagnostic test performed by a radiologist, the radiologist immediately reaches out to the pulmonary fellow. That pulmonologist takes the call from the radiologist, notifies the primary care team of the diagnosis and then the patient is evaluated using a rapid risk assessment test. The Pulmonary Embolism Severity Index (PESI) is a nationally validated scale that determines the patient’s risk of mortality and the severity of complications based on a variety of clinical factors. Once in one of those intensive care units, the patient is further comprehensively evaluated to determine whether they have a massive or submassive PE – the most dangerous condition that has a 60-70% mortality rate from sudden cardiac death or cardiogenic shock, if not treated quickly and aggressively. Pulmonary embolism is often characterized by symptoms that can be vague or easily confused for another condition. That includes dizziness, chest pain, shortness of breath, swelling in a leg and a rapid or irregular heartbeat. In addition to Dr. Benza, Dr. Balaan and Dr. Bihler, other members of the new PERT include cardiologist Manreet Kanwar, MD; interventional cardiologists Mithun Chakravarthy, MD, and David Lasorda, DO; and radiologists Paul Kiproff, MD, and Cory Nordman, MD. Allegheny Health Network is rated the #1 health system in western Pennsylvania and among the top 5 percent nationally for cardiac care, interventional heart care and heart attack treatment according to Comparion® Medical Analytics, 2016 National Quality Rating Database. Comparion also ranks AHN among the top 3 percent nationally for pulmonary care.